Survival can be a challenging proposition. The more difficult the circumstances, the harder it can be to get out from under. However, the more we can call upon our powers of creativity to come up with innovative solutions, the better our chances of succeeding – which can be critical when we have our very existence on the line. So it is for a young man up against trying conditions in the new, award-winning Lebanese drama, ‟Capernaumˮ (“Chaosˮ) (web site, trailer). But all is not lost: Zain captures the attention of Rahil (Yordanos Shiferaw), an illegal alien from Ethiopia who works at the park under an alias using falsified immigration papers that are about to expire. Rahil has her hands full as the single mother of a toddler, Yonas (Boluwatife Treasure Bankole), so she’s limited in terms of how much support she can provide. 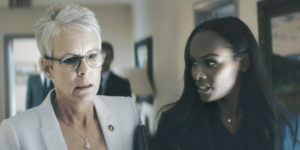 However, given that she now has access to a potential babysitter, she can leave Yonas at home while she works, an option preferable to dragging him to her job and hiding him in a bathroom stall during her shift. And, in exchange for Zain’s child care services, Rahil provides him with food and a place to stay. It’s an arrangement that works relatively well, too – that is, until Rahil is picked up and incarcerated by authorities for immigration violations. To make matters worse, her arrest takes place without Zain’s knowledge. Suddenly the adolescent youngster is left to care for himself and a toddler all on his own. To say more would reveal too much, but suffice it to say that Zain’s circumstances grow progressively more challenging, particularly when he’s forced into dealing with assorted shady characters, such as a crooked flea market vendor (Alaa Chouchnieh), to get by. His survival skills serve him well under these conditions, but eventually even they get pushed to the limit. A course of events is set in motion that require him to make hard choices and take drastic measures that have the potential to land him in trouble. But, with courage and some inventive thinking, he’s determined to have his say – even if it means doing so in court and against unlikely opponents. 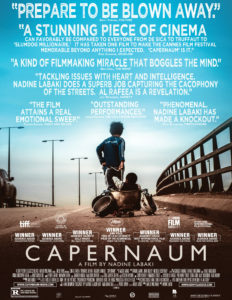 “Capernaum,ˮ which translates as “Chaos,ˮ couldn’t be a more fitting title for this film. The deplorable conditions depicted here are something no one should have to endure, especially someone as young as Zain. Between the irresponsibility of his parents, the street life of Beirut and the circumstances of being thrust into becoming a caretaker for a young child who isn’t even his own, Zain has his hands full coping with the chaos around him. Yet somehow he manages to survive, because he believes he can. The film thus demonstrates what it means to carry on even in the face of incredible odds. It’s that belief in himself that Zain staunchly holds onto that he needs to stay afloat. He possesses an unshakable faith in his abilities to somehow find a way to contend with the challenges facing him. And, with each new obstacle, he must continually steel his resolve to do so, especially since the stakes get upped every time. In an age when it’s become all too easy to abandon responsibility, especially among those in positions of authority, it’s refreshing to see those who are willing to own up to their mistakes and even seek to redeem themselves for their oversights and misdeeds. But even those who genuinely attempt to make up for these shortcomings may face a difficult time of it and through no fault of their own. So what is one to do under such circumstances? 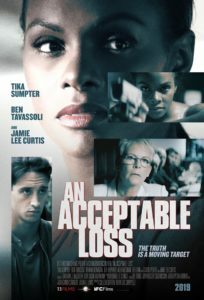 That’s one of the central questions raised in the intense new political thriller, “An Acceptable Loss” (web site, trailer). To say more would reveal too much, but what lies ahead for all concerned – including the nation itself – carries implications of staggering proportions. How everyone fares will depend on how prepared they are to weather the storms coming their way – and whether those preparations are truly adequate. 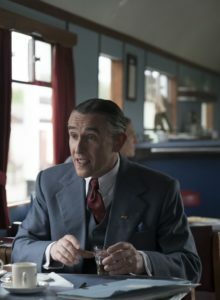 As becomes apparent in the film, both through the main narrative and a series of flashbacks showing how these conditions arose, there are some very driven characters at work here. They’re quite singularly focused, determined to bring about the results they want at seemingly any cost. Such conviction can be a valuable asset, but it can also be a tremendous liability when it’s let loose without consideration for the ramifications. When we seek to elicit what we want without concern for the fallout that can accompany such outcomes, we engage in a dangerous practice that can yield far more than we bargain for, including any number of unpleasant side effects. Such a practice also tends to show a disregard for responsibility. When unintended or unwanted outcomes result from our efforts, we must own up to them, regardless of their nature. For those who do, there may be feelings of regret or remorse that accompany the acknowledgment of these missteps. 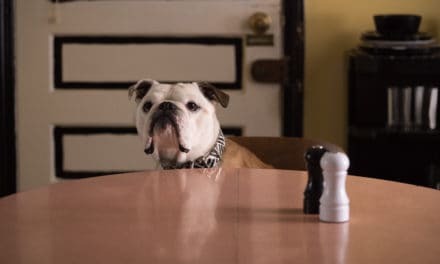 Yet, as difficult as accepting such circumstances may be, we can always make amends for the errors of our ways, and this film shows what it means to go about that process. We’re not perpetually saddled with an unchangeable fate; we can redeem ourselves, though we must be clear about our intents in doing so. And, as this story reveals, there’s certainly an effort being made to make that happen. Of course, for redemption to occur, we must take certain steps first. For starters, we must overcome whatever fears or apprehensions that might hold us back. Then we must implement the actions required to make it possible. This may call upon us to think creatively in terms of the measures we take, sometimes instituting means that are outside the box. None of this may be easy, but it’s always possible. And, considering what’s at stake here, that’s an outcome everyone should hope for. It’s hard to keep a good man – or a good team – down. Those who are determined to carry forward with their plans, no matter what they may be, are usually difficult to contain. And, when you add the power of a collaborative effort to the mix, the ability to hold them back may be nearly impossible. 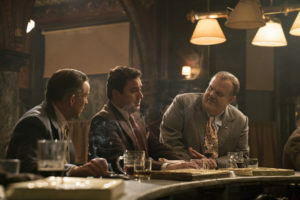 So it was for a comedy duo seeking to revive their career in their waning days as seen in the entertaining new biopic, “Stan & Ollie” (web site, trailer). 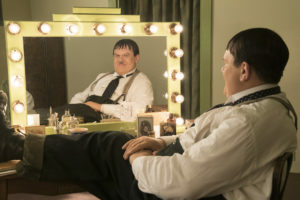 Because Laurel and Hardy were under separate contacts with studio chief Hal Roach (Danny Huston), they weren’t operating on a level playing field, a source of frustration and consternation for Laurel individually (he wasn’t getting his due) and for the pair collectively (they didn’t have the creative clout they sought that a joint contract would afford). What’s more, during his contract dispute with Laurel, Roach paired up Hardy with comedian Harry Langdon for a film called “Zenobia” (1939), an incident that rubbed Laurel the wrong way. 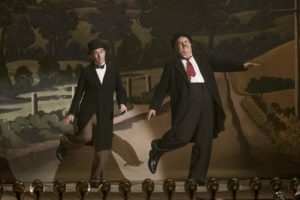 And, even though Laurel and Hardy resumed working thereafter, their career was strained – and waning. 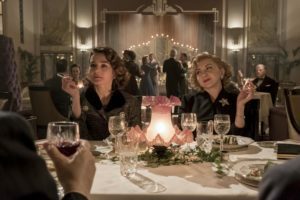 With success now coming their way, Stan and Ollie were joined by their wives, Ida (Nina Arianda) and Lucille (Shirley Henderson), respectively. They were experiencing what should have been the pinnacle of their careers, but such turned out not to be the case. Old resentments surfaced, Ollie’s health continued to worsen and shocking new surprises emerged, all of which conspired to potentially tear the duo apart. But can an established, committed team like this one truly be split up by outside forces? That’s hard to do, even in the face of the most formidable circumstances, especially when those opposing forces are up against the strength of the bond uniting the partners. In a professional context like this, it might indeed sound strange to call the element that binds the collaborators what it genuinely is – love – but that’s what it is nevertheless. 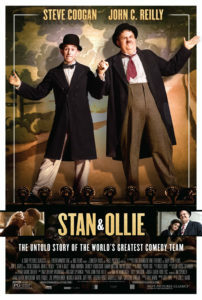 “Stan & Ollie” thus shows us what it means to employ the power of love in a forum other than romance. Whether or not we’re aware of it, it ultimately makes all kinds of tremendous creations possible, be it everything from newborns to classic comedy routines. And, no matter what it’s used to produce, we should be forever grateful that we have it at our disposal for whatever creative purposes we choose to explore. PreviousHow does a Parent say Goodbye to a Child? If he’s Joe McQuillen he Doesn’t! He says HELLO!